Udvartina - a stimulating massage with herbal powders and warm oils to powerfully exfoliate and deeply detoxify the tissues. Good for: obesity, lymphatic congestion, sluggishness, detoxification or cleansing, certain skin conditions. Benefits: cleanses and nourishes the skin, increases circulation and lymphatic flow, breaks down excess adipose tissue, reduces kapha dosha. 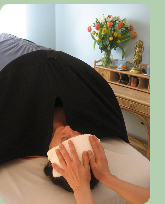 Traditionally, Ayurvedic bodywork is performed by two therapists working simultaneously on opposite sides of the body. The mirror-image motions of the rhythmic massage is an unparalleled experience of sensation and relaxation. The rhythmic motion of four hands over-whelms the mind with sensation and helps it to relax into a meditative state more quickly. For this reason two-therapist treatments are always used during Panchakarma, but they also make a wonderful single treatment. Good for: sinus and lung congestion, allergies, cloudy mind and senses, cough, cold, neck and shoulder tension, headaches. Benefits: clears sinus congestion, opens breathing passages, aids in draining excess lymph, relaxes muscles, improves mental clarity and sense perception, balances Kapha dosha. Note: Abyanga or vishesh are an excellent addition to a SAN treatment. Good for: conditions of the nervous system, anxiety, insomnia, nervous conditions, headaches, stress, overwork, exhaustion, jaw pain, restless body and mind. Benefits: relaxes muscles of the head, neck, and shoulders, calms the central nervous system, quiets the mind, may induce profound relaxation and deep states of meditation, balances Vata dosha. Note: Price is dependant on the type of oil. Good for: heaviness, sluggishness, congestion, muscle aches, joint stiffness, certain skin conditions, heat intolerance. Good for: conditions of the nervous system, chronic tension areas, trauma or injury, overactive mind, imbalances of prana, emotional disturbances. Benefits: balances the flow of prana, removes energetic blockages, calms the body and mind and emotions, stimulates the body's natural healing energy. Benefits: relaxes muscles of the low back, sacrum, and pelvic region (softens and warms tissues and opens the channels) to restore balance, calms the nervous system, rejuvenates the spinal column, and balances vata dosha. 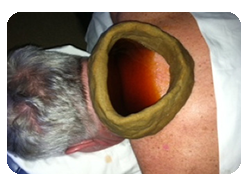 Note: Basti can be used on other areas of the body for rejuvenation (examples - neck, spine, heart, joints). Netra basti - a reservoir is created around the eyes with dough, then the eyes are bathed in ghee or herbal oils. Good for: eyes strain, vision problems, pain or inflammation of the eyes, tension of the face or head, chronic headaches, dry eyes, dry, wrinkled skin around eyes. Benefits: releases inner tension of the eye sockets, soothes dry or heated eyes, improves eyesight, nourishes the central nervous system, reduces pitta and vata dosha, calms prana vayu. Potli - warm bundles of an herbal mixture are soaked and heated in medicated oils, then used to massage the body, especially joints and spine. Good for: muscular aches and pains around joints or spine, imbalances of the spine, joint inflammation, stiff joints. Benefits: reduces inflammation of the tissues, warms muscles increasing circulation and relieving tension, rejuvenates joints and spine, releases adhesions. Note: Potli and bastis are often combined in session to maximize the therapeutic results. For deep rejuvenation in areas with injury or chronic imbalance, a series of these sessions, once or twice a week for a total of eight weeks, is recommended. Ayurvedic Consultation- learn the basic principles of Ayurveda to recognize your own unique constitution and choose a lifestyle that supports health and balance. In the initial consultation we will discuss Ayurvedic concepts such as the five elements, the three doshas, the twenty gunas, your doshic constitution (prakriti), and your current imbalance (vikriti), as well as a plan for restoring and maintaining balance in the body, mind, and spirit. Recommendations may include daily cleansing practices (dinacharya), seasonal cleansing practices (ritucharya), variations of routine, diet, exercise, yoga, pranayam (breathing techniques), bodywork, or herbal support. Thai massage is an ancient healing art of traditional Thailand medicine. It is bodywork known for increasing flexibility, relaxation, and energy flow, and is based on the wholistic point of view that any problem is not simply an illness of a particular part, but rather a disorder of the whole. Through muscular and skeletal movement and pressure, energy flow can be stimulated and blockages released. Other benefits include increased range of motion, warmed tissues, and a stimulation of the flow of blood and lymph. Ayurveda is the "sister-science" or yoga, and it can enhance the therapeutic effects of your yoga practice with knowledge of the postures, breathing practices, and meditations that can create balance for you. We use both Yoga and Ayurveda in each session to create a daily practice for you to take home or just design a specific flow for your current needs. Yoga is the best learning tool for keeping you in touch with your body. It can help to keep you healthy and flexible, as well as keep your joints lubricated. But probably the most important aspect of yoga in this day and age is its ability to reduce stress and bring peace of mind.